Cockatoo refers to the twenty-one species of parrot-like birds in the family Cacatuidae, immediately characterized from other parrots by the presence of a flamboyant crest on the tops of their heads. Found in Australia and nearby island countries, cockatoos are at once familiar cage birds or agricultural pests; both have severely impacted the numbers of several species, and caused Australia to pass legislation barring exportation. Most species of cockatoo are medium-sized birds, with an average length of 15-18 inches. The smallest is the cockatiel (Nymphicus hollandicus), which is 13 inches in length, while the palm cockatoo (Probosciger aterrimus) at 24 inches is nearly equal in size with the largest macaws. With the exception of the cockatiel, all cockatoos have a short, blunt tail. All cockatoo species bear a crest on their heads. The crest is raised if the bird is excited or threatened, and in some species it is a display of a contrasting color to their overall plumage. 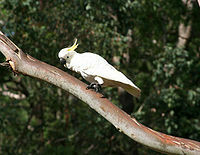 Cockatoos have an upright stance when perched; when not flying they move about in the trees using their hooked beak as a climbing aid. On the ground they walk with a rolling gait. Both feet are zygodactyl, i.e. two toes in front, two toes behind, a trait shared with owls and woodpeckers. Cockatoos further use one foot as a "hand" to hold and bring food to its mouth. Cockatoo plumage differs from other parrots in that the feathers do not contain the brilliant colors caused by psittacofulvins. The various species have as their base plumage either black, white, or pink as the main color; contrasting colors, such as red or yellow are either part of the facial skin or the crest. This page was last modified on 9 April 2019, at 01:43.